This still from a Red Bull Stratos webcast shows ground crew members inflating the 55-story helium balloon that will carry daredevil Felix Baumgartner to his 23-mile target altitude for his supersonic skydive, which would be the world's highest skydive, on Oct. 14, 2012. This story was updated at 11:05 a.m. ET. Austrian daredevil Felix Baumgartner is once again ready to attempt the world's highest skydive today (Oct. 14), and plans to break the sound barrier while he's at it. After two delays due to high winds, Baumgartner is expected to don a spacesuit-like custom pressure suit and ride a capsule 23 miles (37 kilometers) into the sky, only to jump into the void in pursuit of the skydiving record. The high-altitude balloon carrying Baumgartner's capsule will liftoff from Roswell, N.M., a place more commonly associated with a rumored UFO crash. The record-chasing mission, called Red Bull Stratos, is sponsored by the energy drink of the same name. Daredevil Felix Baumgartner is shown inside his pressure suit and capsule ahead of an attempt to make the world's highest skydive, a supersonic jump, on Oct. 14, 2012, from Roswell, New Mexico. If all goes according to plan, the 43-year-old Baumgartner will go supersonic during his 5.5 minutes of freefall back to Earth and reach speeds of up to 690 mph (1,110 kph). He would be the first person to break the sound barrier without an aircraft, and do it on the 65th anniversary of the first supersonic flight by Chuck Yeager in the X-1 rocket plane in 1947. You can watch the skydive live here on SPACE.com. Red Bull Stratos meteorologist Don Day said in a statement that Baumgartner's balloon was expected to be ready to launch by sunrise (6:45 a.m. MT, 8:45 a.m. EDT/1245 GMT), if weather conditions allowed. The launch window extends through 11:45 a.m. MT (1:45 p.m. EDT, 1745 GMT), he said. Baumgartner is chasing a skydiving record that has stood for 52 years. In 1960, U.S. Air Force Capt. Joe Kittinger rode a balloon-toted capsule to an altitude of 102,800 feet (31,333 meters), setting the bar for all skydivers to come. Kittinger serves as an advisor on Baumgartner's mission, which is also aimed at studying "how the human body copes with the extreme conditions at the edge of space," according to a description. "We are going to get your goal and your dream accomplished Felix," Kittinger radioed Baumgartner from Red Bull Stratos Mission Control, according to a mission Twitter update. For Red Bull Stratos, which organizers have touted as a jump from the "edge of space," Baumgartner aims to leap from a height of 120,000 feet (36,576 m). While the jump will set the record as the world's highest skydive, it would still be short of the widely recognized boundary of space, which is an altitude of 62 miles (100 km). USAF Capt. Charles E. Yeager (shown standing with the Bell X-1 supersonic rocket plane) became the first man to fly faster than the speed of sound in level flight on Oct. 14, 1947. Still, Baumgartner's Red Bull Stratos skydive would rack up a series of records. In addition to the highest skydive and the first supersonic freefall, the skydive would mark the longest-duration freefall and the world's highest balloon flight. He will fall through two of the four major layers of Earth's atmosphere during the dive. Baumgartner must be careful jumping from his capsule to avoid damaging his pressure suit or helmet. The air at his target altitude is too thin to breathe. The pressure difference could also cause bubbles to form in his bloodstream, commonly referred to as "boiling blood." A loss of control during his descent could cause Baumgartner to lose consciousness. He has staged two successful practice jumps — from heights of 71,581 feet (21,818 m) and 97,146 feet (29,610 m) —respectively, earlier this year to rehearse for Sunday's attempt. The 55-story balloon that will be used to lift his capsule is extremely thin, about the thickness of a plastic sandwich bag. 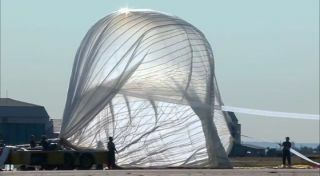 Strong winds could tear the balloon, Red Bull Stratos officials have said. To avoid balloon damage, Baumgartner will only liftoff if winds at or near the liftoff site do not exceed 2 mph (3.2 kph). High winds were the reason Baumgartner and his Red Bull Stratos team skipped a chance to try the skydive last Monday (Oct. 8), and then aborted an actual attempt on Tuesday. Red Bull Stratos officials are optimistic for better weather on Sunday. "I'm here with my family and friends who are all super supportive. I go to the gym and try to keep myself fit," Baumgartner said. "I've done all of my homework. Had all of my briefings with the team I trust. All we are waiting for now is the weather."